High-performance wired dynamic microphone from DTP Percussion series that was specifically designed to accurately capture the sound of tom drums and percussion instruments, providing a maximum of acoustic presence and clarity even in high sound pressure level applications. Its supercardioid polar pattern provides high gain before feedback and maximum isolation of the desired sound source – side and rear sounds are effectively rejected. The rugged full-metal die-cast body features a hardened steel mesh grille and makes it a highly durable professional gear. A gold-plated 3-pin XLR connector is provided. Frequency range: 40 Hz-16 kHz. Sensitivity: 1.4 mV/Pa (-57 dBV). Rated impedance: &lt;500 Ohm. Dimensions: 41 x 94 mm. 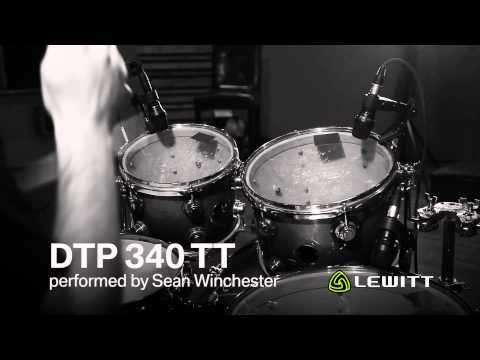 Weight: 165 g.
Do you own LEWITT DTP 340 TT or have you had a chance to try it?